Identity Hosts Public Charge and Immigration Information Event – Identity, Inc. Representatives from the non-profit legal aid organization Ayuda shed light on immigration rules around the issue of ‘Public Charge’ for Identity families on March 28, 2019. 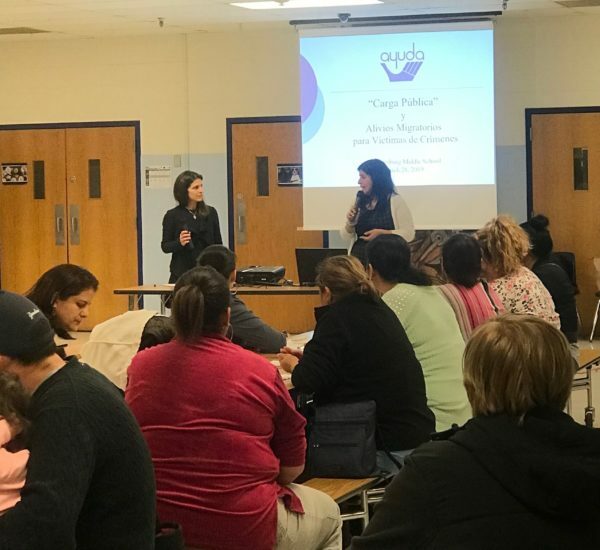 Ayuda Lawyers Beth Simon and Maya Zegarra explained to a crowd of over 50 Latino families at Gaithersburg Middle School the ramifications of possible changes to the criteria for a pathway to citizenship. A public charge is defined as someone who is likely to become dependent on the government to survive. If determined to be a public charge, that person will not have a pathway to citizenship. To make that determination the government uses a test called the ‘Public Charge Test’. Currently, the Public Charge Test looks at only two types of benefits (cash benefits and long term medical institutional care). There are some lawmakers who want to expand the definition to include SNAP, health and nutrition programs, and non-cash assistance. Ayuda’s Simon and Zegarra emphasized that not only are these expanded services not currently detrimental to the test, but there are other factors considered like age, education, and assets. The test is applied when a permanent resident applies for citizenship or is renewing their residency. These stipulations only apply to the person applying for citizenship and NOT their U.S. born children. Participants also received information on avoiding legal services fraud and immigration relief options for crime victims.